I have decided, once again, that my clay recipe is in need of some improvement. As I write this, I am amidst the long and involved process of retooling my clay body recipe for optimal results. It has been a couple years since I mixed my own clay and find myself eager to return to it. While not a total overhaul, I hope to make my clay recipe a bit cleaner burning, whiter, smoother, more vitreous, and less pyroplastic, while expanding it’s workable temprature range. About a year and a half ago, I switched from mixing my own clay of my own formulation to buying pre-mixed clay of somebody else’s fromulation. I did this largely because it was essential that my clay be pugged, but I didn’t have access to a pug mill, and certainly couldn’t have afforded one at the time. I tried a number of commercially produced pugged clay. It was ok, but there were some major issues. I will refrain from mentioning a manufacturer, but across several thousand pounds, from different batches and lot numbers, I was getting large flakes of rusted metal in my clay. Attendees at a workshop last spring witnessed me pull a chunk about 3/4 of an inch wide out of a freshly opened bag of clay! This would absolutely NEVER happen if I were the one mixing the clay (as opposed to a laborer who may not even work with clay, let alone know how critical it is that porcelain be pure). I know that something like this can and did cost me big time in terms of work lost, so I really prefer to be in the driver’s seat. I’m doing something very risky and technically challenging with my clay. Although I was able to get beautiful results and decent (by my standards) survival rate, the clay was not a glove fit for my work. It could have used a bit more tooth (stand-up ability and reduced shrinkage) and a bit less pyroplasticity (the sagging and warping that occurs during the firing as the clay melts). It had a narrow firing range. If it was a bit overfired to cone 7, it would cause the glaze to craze(or shiver, hard to tell which). When buying my clay, I had a few options but couldn’t do anything to change small things about the clay other than to keep buying and testing new clays and hope something worked. I would much rather be responsible for. and in control of, all aspects of my material. I was using a clay body for more than a year and was really dialed into the nuances of that particular clay. I then moved to the other side of the country to be a resident at the Archie Bray Foundation. I was not able to bring clay with me, and it was not realistic to ship 500 pounds of clay from the east coast to Montana. It took most of the summer to figure out the new clay and so I didn’t really get anything done there. This would have never happened if I had a decent recipe that I knew how to use. Never again. I have no real shortcut for developing clay bodies. It is just a matter of handmixing a series of carefully chosen tests. I recommend doing this often, as you will learn a lot about the properties of the various raw materials you have available. So my starting point was the old recipe I posted a long time ago here. I then made some initial substitutions based on a little research and some recommendations from others. One thing I learned from using commercial clay is that the whiter the clay is, the more bright and vibrant the glazes appear. The Laguna #16 I was using was immaculately white, and the my pots became instantly more attractive with it’s use. I decided to replace the EPK with Grolleg Kaolin, as it is more pure, and more consistent from bag to bag. I also replaced OM4 ball clay with C&C ball clay, known for it’s whiteness and commonly used in the formulation of porcelains. 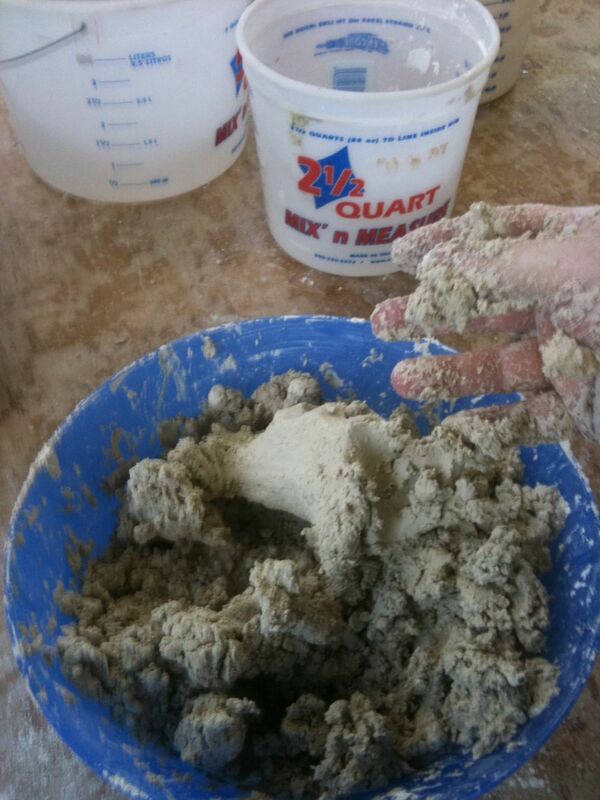 Now, the dirtiest thing left in the recipe was the bentonite. I tried using macaloid, which is very white, but insanely expensive. The 2-3 percent addition nearly DOUBLED the price of the clay batch. Dennis at Northeast Ceramic Supply, my new distributor, turned me onto Bentonite L-10 White, a very white but still reasonably priced bentonite. I believe that this is what is used in Laguna’s commercial clay bodies, which, as I’ve said before, are astoundingly white, and quite plastic. The ratio of Flint to Feldspar is actually right on point, allowing a perfect fit with my glazes from cone 5 to cone 8. Range is important when firing electric kilns as I do. Rarely is the temperature even top to bottom, and with the basic one-thermocouple computerized kilns (which I don’t like but am currently using at the new studio in Bennington College) there is little you can do to even the firing out as it’s going. Keeping the ratio the same, I decided to update the feldspar choice. I was used to Kona F-4, initially chosen for it’s whiteness and improved resistance to thixotropy over Nepheline Syenite. Thixotropy is the physical property in which the clay is a rock hard chunk and then goes too soft after you wedge it or throw with it, slumping and failing to hold it’s shape. This is caused by soluble salts in the feldspar that raise the pH of the water between the particles which, just like soap, lowers the surface tension of the water and thereby reduces the effectiveness of the suction between particles. Nepheline Syenite, while reportedly a better melter and also very white, is very prone to thixotropy. I really liked Kona F-4, but they have discontinued the mining of it, and although you can still find it, it’s a good idea to switch to something available for the future. There are basically just 4 choices to make in the feldspar realm nowadays. Custer Feldspar, Minspar 200 (formerly NC-4), G-200 HP aka “New G-200” and Nepehline Syenite. Custer has always been a ubiquitous material in my experience. It has a yellowish color in the raw state and has impurities that cause it to fire a bit grey. Not the best choice when whiteness is an issue, and also it is more expensive than the others. Minspar is the main Soda Feldspar on the market now. According to sources like the Ceramic Material Database It is nearly identical to Kona F-4. G-200 HP is a new (and welcome) addition to the North American feldspar lineup, in that it previously was blended with NC-4 to create a middle-road between a Soda and a Potash Feldspar. They stopped doing it, and so the new G-200 H(igh) P(otassium) is more truly a potash feldspar. Custer is the one in the middle. You can blend G-200 HP and Minspar to get the old G-200 if you need to. To mix these test, I first weigh out 2000g batches. This allows enough clay to test the shrinkage with test tiles, as well as how the clay performs when I make a pot out of it. Once weighed, the powder is dry-mixed and then water is added. 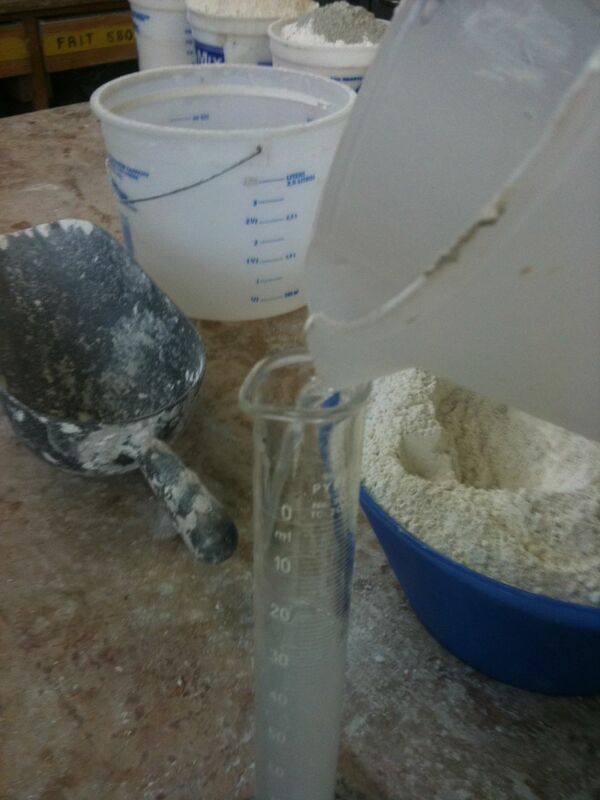 It is important to measure and record the amount of water used for two reasons: as an additional measurement of relative plasticity, and to help speed up the mixing process once a clay recipe has been chosen for use. Start by adding less than you think you need, and slowly add more water as you mix until the clay just barely comes together. It should be crumby and short at this point. Wrap the clay in a plastic bag and let it sit for a couple days for the most accurate results in terms of workability. Thank you for the detailed explanation – really useful info. I used to make my clay body years ago using a very simple formula – before you could readily buy packaged clay – it really just was part of making pots. 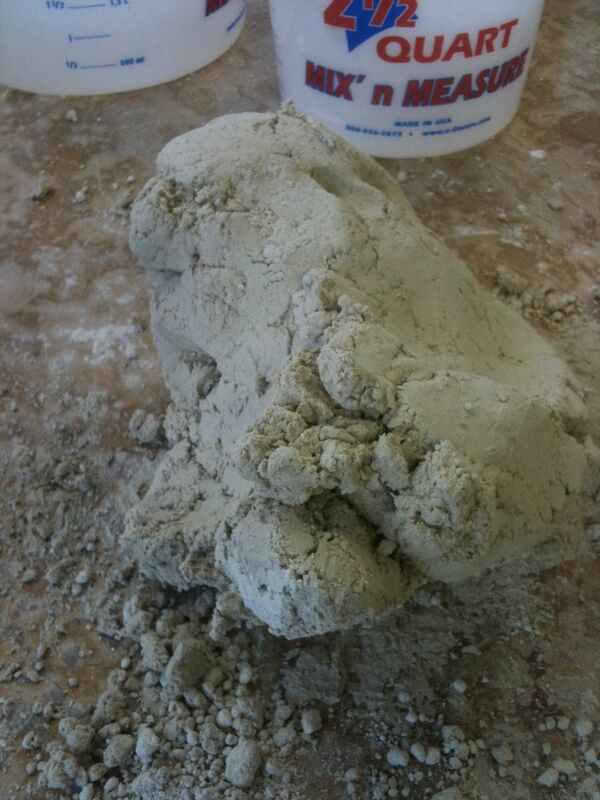 Today so many students don’t even like to wedge clay let alone think of making their own clay. I’ll look for your book in the future. I’ll get right on that, Hannah! I wish I had the time to do that. Maybe someday. I havn’t made my own clay since 70’s. I’d like to pursue this process, but how do I know the diff between my clay (cone 6-10 stoneware from Minn Clay), which my glazes work well on, and the above clay recipe? I make my own glazes, and enjoy the whole process. Any suggestions? Nice work. The only thing I like to do is mix the body like a glaze, with lots of water. Then pour it on a plaster bat. That gets you maximum plasticity in the shortest time. What was the shrinkage and absorption rates? This is a great study Jeff. I look forward to seeing your new porcelain. I have many issues also with Laguna #15, but I love the whiteness and the tightness of the clay, so I have put up with it. You may make a clay maker out of me. I’ll still buy the leftover #15 that you have. Maybe I can come by when I’m on spring break. I’ll check in with you before then. Thank you for being so generous with all your post’s! Great to see someone else striving for perfection. 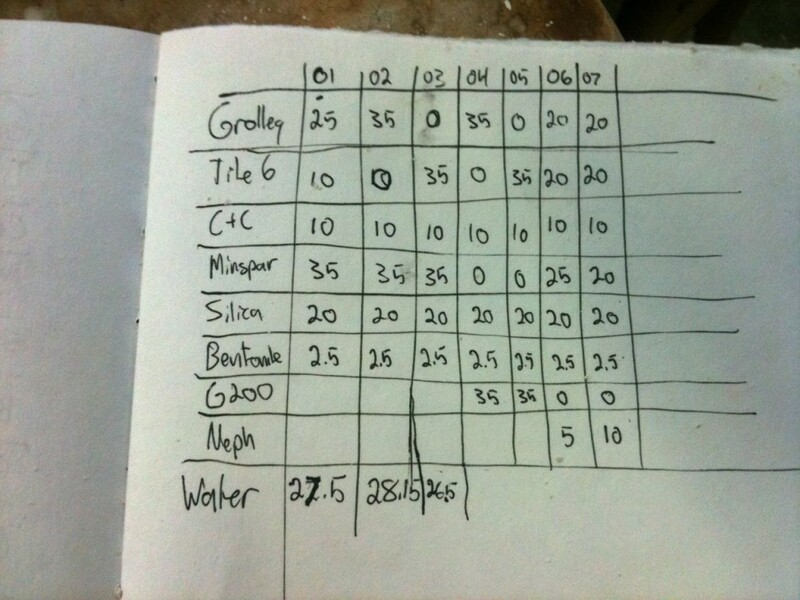 I’ve been formulating ^6 porcelains for around 12 years. My requirements are a bit different, but with one of my porcelains I still came to the same conclusion as you: Grolleg, 6 tile, and C&C in roughly the same proportions. Yes, I also have to mix it up myself for quality control. Hey Jeff, Thought I might let you in on how I balance the neph sye in my body…i just add epsom salt to the water im mixing the clay with. Just a handful for every 200 pounds…this will keep the clay from deflocculating . This will give me a good place to start formulating my own clay bodies. Thanks! I have 2,150 pounds of Minspar 200 in 50 lbs bags with a certificate of analysis from March of 2011 that is surplus. Please e-mail or call if interested. In Cincinnati, OH. A few years ago, the studio I work for had trouble with metal pieces in a Laguna clay (can’t remember if it was the #16 or cone 6 Frost). The pieces were mostly small, about 1-3 mm each. Laguna told us that it was a metal pipe that had fallen into the batch and shredded… but from the sounds of it, this is an ongoing problem. I can’t believe how incredibly irresponsible they are with the health, safety, and livelihood of their consumers! I really like the looks of the clay body and hope to try it,I am use to using armadillo clay in Austin here in Texas, so I am more into there high fire clays. 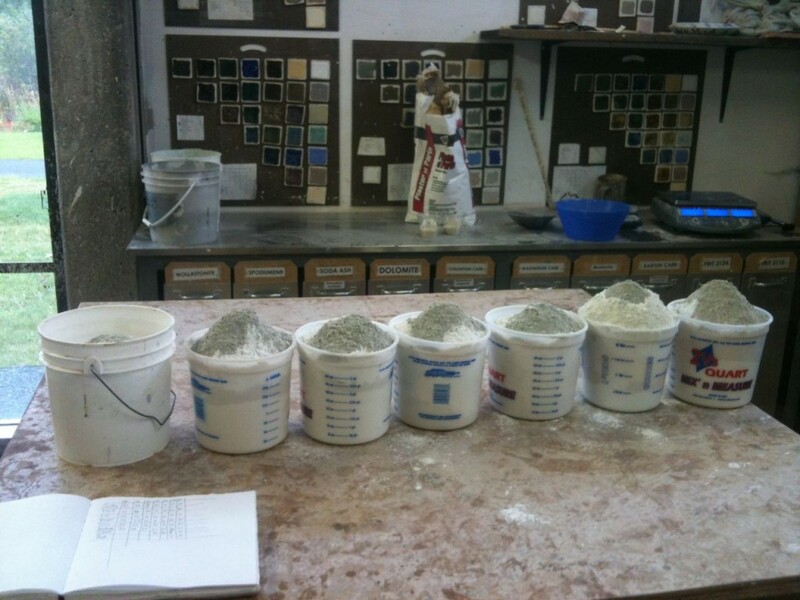 I work exclusively in Hi Fire, but I have worked in low fire clays.Did you use amaco gloss series on your bisque ware? Hi Jeff, I to am reworking my clay body. I am having trouble with my flashing slip shivering off during the bisc. To high sodium in the clay body seems to be the culprit. I am delighted that you are on the front line of monitoring the feldspars in North American , rest easy all! Jeff’s on watch! From one clay geek to another, I thank you.